If you can think like a teacher who cheats, and look again at the sea of data - patterns come to light. Patterns, which are subtle, buried under mountains and mountains of data. When looked at through varied lengths, suddenly it's just as clear as day. And when you know what to look for - You can't help but say [when] it has to be cheating.What he's really good at is: "PRETEND[ING]". He's a cheater a criminal, a thief, a cheat - all these things because really he's not far from it. I mean if you really think about what an economist is - the line between an economist and criminal is terribly thin. As the Steven & Stephan said above, when data is looked at via varied lengths and modalities - suddenly things can become as clear as day. This article is not seeking to endorse Austrian economics or debase Keynesian economics - rather it is focused on the data. We are probability and data analysts/statisticians. This article seeks to go into some considerable depth regarding the examination of the statistics and data whose subject was begun in the previous article: IMAGINARY NUMBERS. Hopefully, this presentation also derives implications that can be clear as day. These days, the line between monetary planning and criminality appears to be very thin indeed. Malinvestment, asset manipulation, unimaginable leverage, theft, distortion & falsification, goal-seek & curve-fit data, false pretenses, special interests and every form of systematic, media & political manipulation - central planners/bankers have metamorphized the benevolence of their supposed task into an art form of criminality on a scale that even the largest criminal syndicates in history would and could not conceive or dream of executing in their wildest fantasies. If this paragraph sounds like a stretch, let alone a mouthful, please consider the accompanying charts and content before making your interpretation. 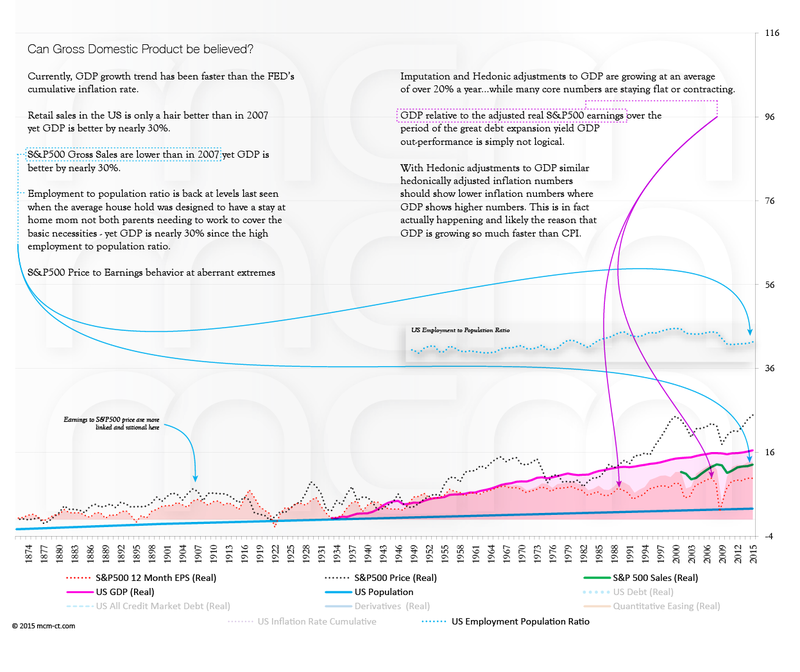 Previously, on examination of the machinations of GDP (and by reference CPI and PPI) it is clear that the greatest area of innovation and growth in the US economy (and others too) is in the areas of "productive" economic contributions that do not require official transactions, can not be proven (and, therefore, can not be easily disproven) and employ new and fantastical techniques of conjuring. MAGIC. We have touched on the subject of the astounding growth rates of imputations and hedonic adjustments but have not put them into broad perspective. This article seeks to add detail and perspective for the earlier observations. In light of broad data that can lead to some objective conclusions, we, therefore, examine many dimensions of data in detail: government/FED data, reporting, statistics and analysis. The Federal Reserve System provides a database called FRED that is available from the St. Louis Federal Reserve. This database presents a whole host of variables with which one can see a vast amount of data - much of it useless and inaccurate. If the huge amount of effort that has been put into these data stores were accurate and useful, it follows that the FED would have at least been aware of any one of the issues leading into 2007 and 2008. However, as is most often the case when one seeks to engineer data to bias a specific scenario, it becomes quite impossible to look at and for that which one is struggling so very hard to avoid. As it stands, most all Central Planners, especially the FED, missed every single one of the above issues. 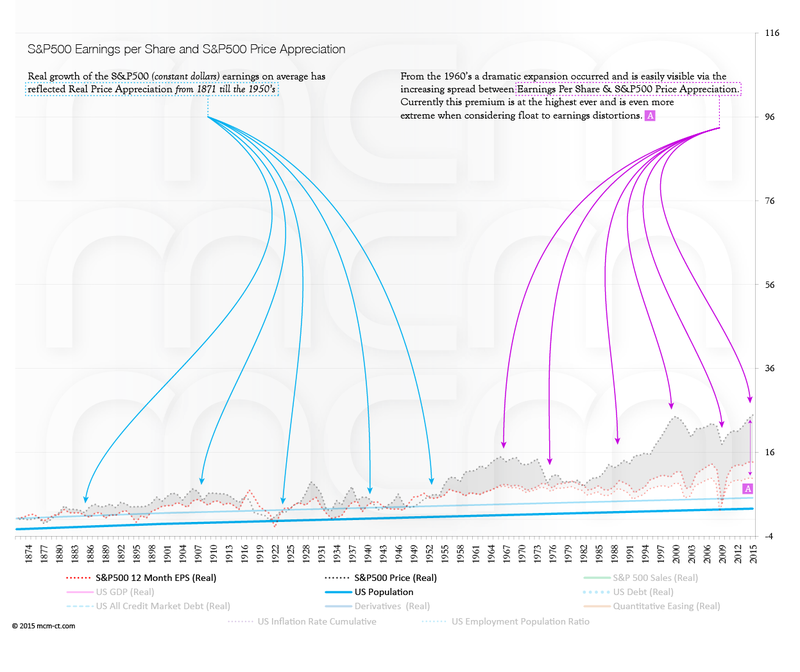 Since the 1960's debt and leverage have expanded by orders of magnitude over earnings as reflected in the charts below. Tremendous leverage seems to be primarily shifting money from one account into another, with inevitable risk, depreciation and spread eating away at it. This is providing negative real economic impact, which can also be seen in the charts below. 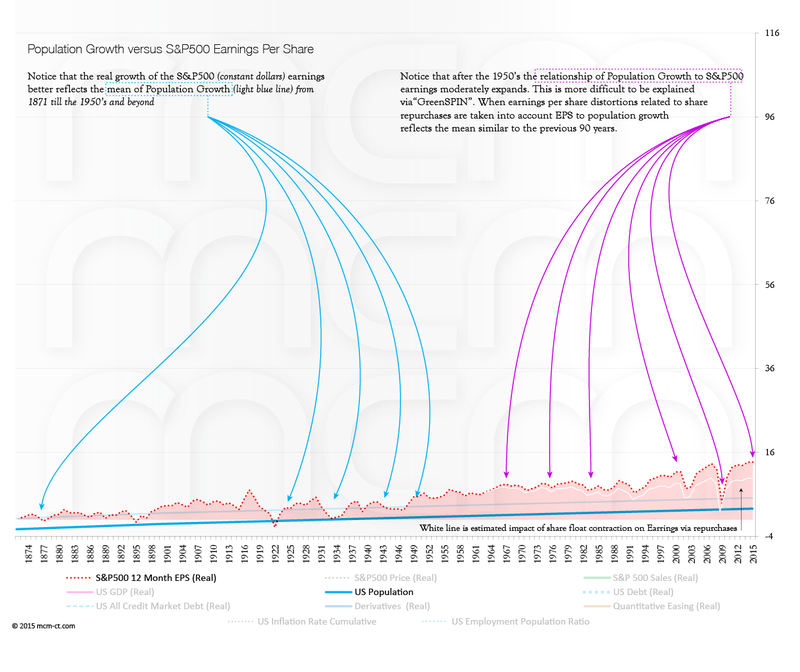 This negative impact can be interpreted directly from a look at the unimaginably large leverage increases resulting in a roughly net zero impact (or worse) in real economic terms. 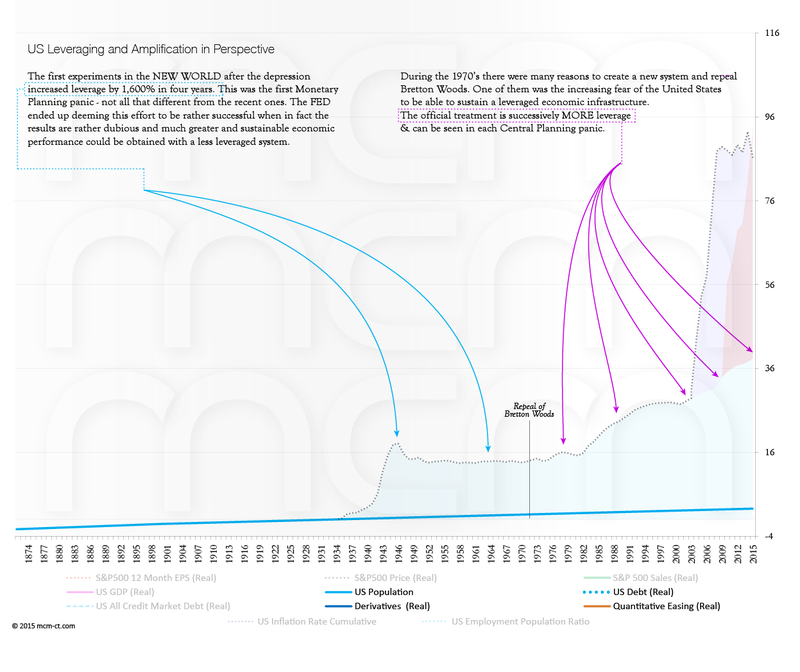 Globally, central planners have attempted to leverage as much as possible. More than imaginable. The thinking apparently is that ultimately this persistence would at some point break the resistance of people to accept finally the virtuous cycle they imagine. In most cases, central planners have more and more often resorted fiddling with data, as it is clear the FED has been doing. However, this is just another ploy to try to break the psychological resistance people have to the central planners ever near virtuous cycle. These are the basis for ever more and more credibility destroying, unsustainable and highly questionable policy. Please click on the navigation buttons on the chart below to scroll through each chart. There are 17 charts and you can navigate via the location dots at the bottom of the chart or the left and right navigation arrow controls. 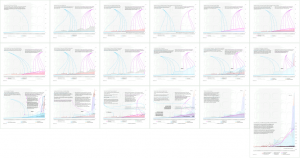 We recommend that you click on the title link to view this article in detail which will then accommodate the largest chart sizes. The method of viewing the charts below is quite effective because each fades into the next which makes it easy to track the changes from one chart to the next. If you would like to refer to a gallery, here is a dedicated page with thumbnails of all the charts. 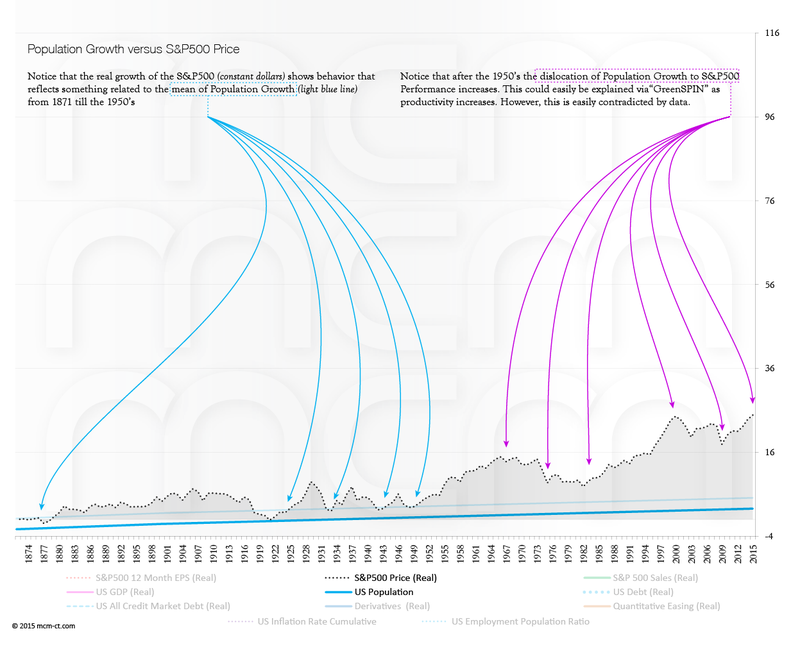 Since Alan Greenspan attempted to stabilize the markets out of the 1987 crash and the deep recession into the early 90's via any means necessary, derivatives and productivity became absolutely wonderful sound bytes in the 1990's to project a "NEW" era of order, stability, prosperity, growth etc. Nothing could have been further from the truth. 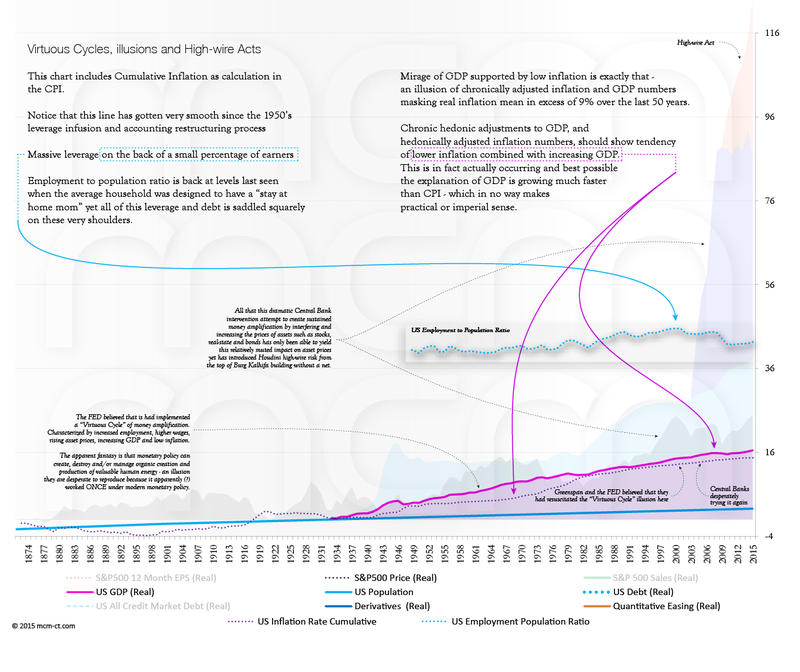 It only takes a brief look through our charts to see that the productivity hyperbole was nearly a complete fabrication. 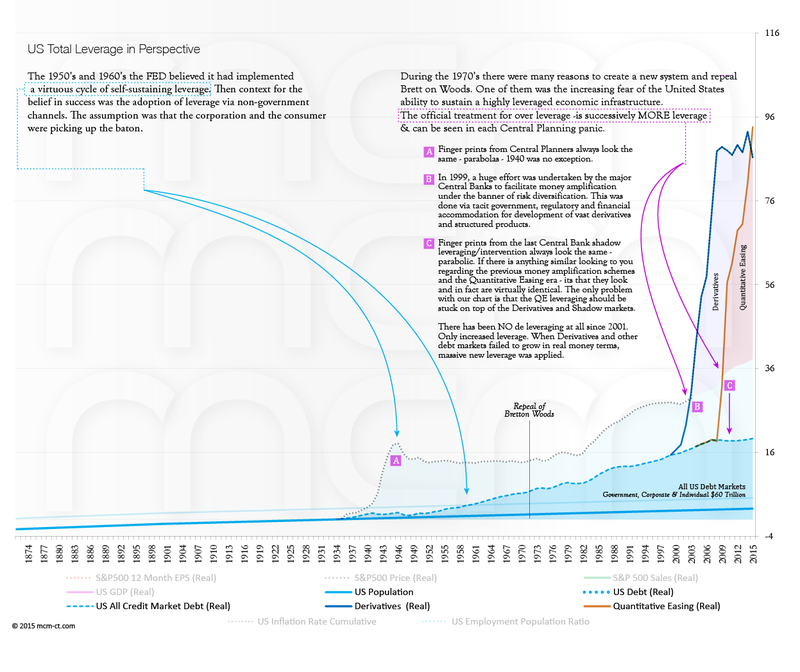 Sure, new technology enables more efficient process and operation, however, the banking system and the tremendous debt and interest obligations of the "NEW" era quickly absorbed and re-purposed productive capital and energy into the wasteful and tangential elements that rewarded fools and penalized producers. Ultimately, producers figure out the trick to getting their slice and realize that they are better off trading and playing the game than doing something productive. Derivatives, risks have increased for many reasons. Primarily stresses on real liquidity and real collateral. However, also because the markets have grown...now receded. Much derivative risk can not be quantified because it is NOT exchange traded performance bonded. With the FED's roughshod through the house of mark-to-maturity, mark-to-excuse-du-jour accounting - these risks are covered up behind the back room trap door. 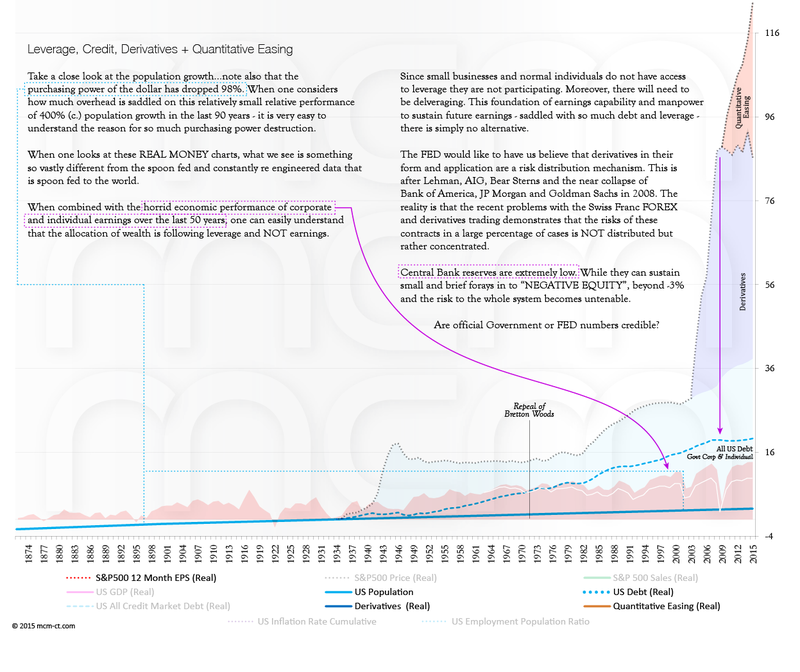 The one thing that is certain, like the Greece debt debacle is now twice the size it was just 4 years ago when every financial TV journalist indoctrinated the world with how irresponsible the Greeks were and how they would never be granted any credit with the large Central Banks if they defaulted...the Derivatives problems will likely be MUCH bigger next time. Why? Similar to Greece, AIG, Bear, Lehman the Central Banks rewarded imbeciles and have sought every technique known to man to avoid deleveraging...even if it means having to make up numbers to loan Greece 340,000,000,000 when it's clear they had just effectively defaulted on their previous obligations. Call me stupid, but Greece is not at fault here. The bankers ramming sovereign debt issued by insolvent nations to yields of 2% and below with a "take no prisoners" approach are responsible for Greek's inability to repay. Who does Greece think it is anyway - Ukraine? From a rational perspective, central planning revolves around the concept of data dependence and disciplined application of structure and rules. What Kind of structure and disciplined application of data is it that both grants a state in full default - Ukraine - funding, and simultaneously, a state that is in paralysis but far more manageable situation - Greece - no funding? What kind of data can possibly support these types of contradictions? Most likely none. This leaves a perfect entry for discretion and data engineering to adapt the situation to a desired outcome with no discipline whatsoever. Perhaps, discipline is evident in no other form than the ticking boxes that indicate data was used in the analysis process? If this is any example, then are central planners acting as glorified discretionary managers regardless of data or mandate? 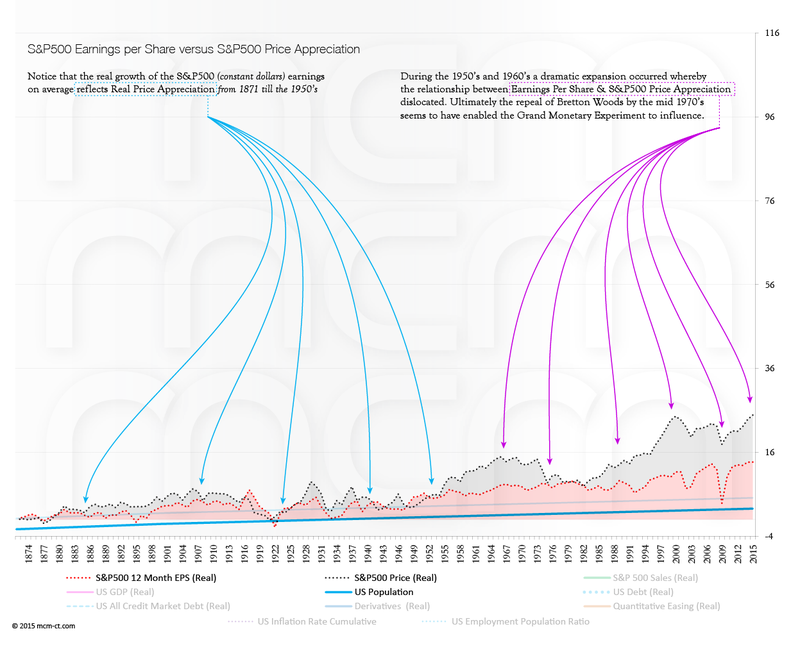 The implications are clear, for the charts presented earlier, no self-respecting data analyst would entertain the protocols that have been undertaken. However, a discretionary process supported by constantly revised data and mechanics fits the bill very well indeed. Could this be the reason that central planner decision making is so persistently rhyming with thinking that are so highly irrational and biased? If we look at derivatives and say that we know 50% of what is going on. OTC derivatives stand at $650 trillion dollars; this creates a variable in our 50% scenario of $325 Trillion. Considering that OTC represents only a partial representation of outstanding derivatives risk, using only this 50% of reported positions as a basis is a reasonable hypothetical. 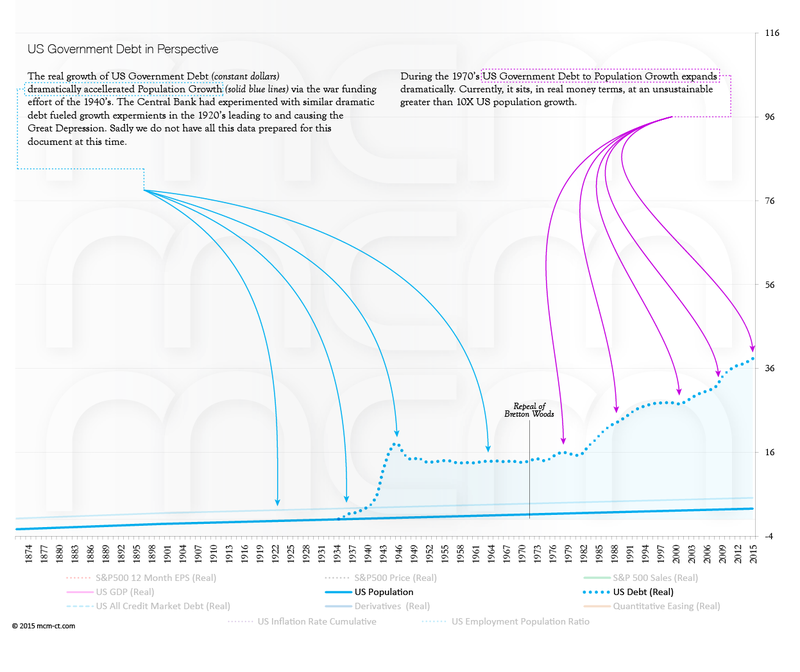 A few capital calls, accidents, counterparty failures, settlement or shadow derivatives issues later and a small problem might become unmanageable risk of 12.5% of $325 Trillion - or over $40 Trillion - easily higher. These are gargantuan numbers, and there is NO plan B. Given that the FED has proven that they have a mathematics deficiency. Could this deficiency be a side effect of having a dopamine laced “Control-P” key? Regardless, of this debilitating condition, all the issues presently are more untenable than they were in 2007. Yet the FED is sanguine and "la sai fare" of the risk of achieving negative equity of under -2% on its own equity. So, it is continuing seeks to find ways to expand leverage at just about any cost. The quality of life and stress levels for 98% of people are high because 98% lines up very well with the little blue sliver on our charts called “the population." 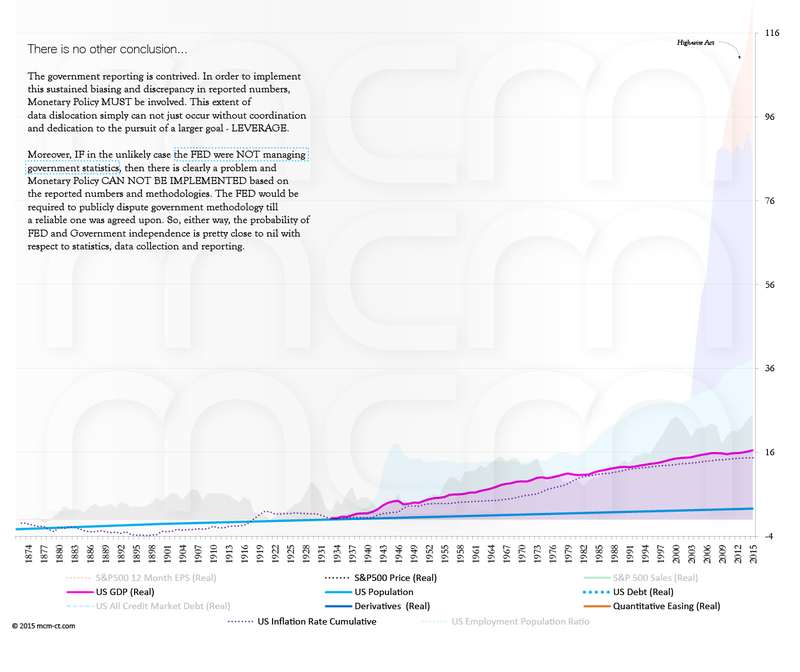 The population has 98% percent risk while the 2% has 98% potential as can clearly be seen in these data presented here. How can quality of life for Greeks or Americans get better when linear extrapolators who are practically, philosophically and mathematically challenged like Mario Draghi, Ben Bernanke, Janet Yellen, Alan Greenspan, Haruhiko Kuroda, Christine Lagarde are in charge? Debt servitude has only one result, no matter how much dopamine is added to the Control-P key. 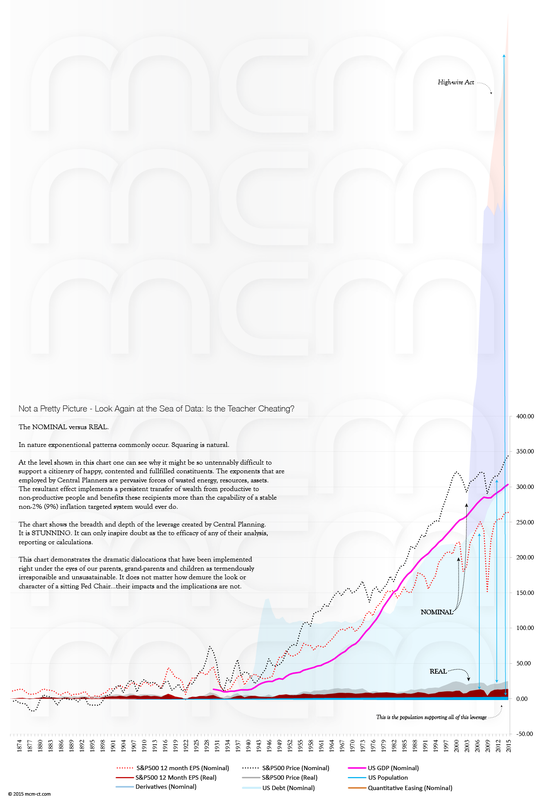 The significance of the chart below is that it shows the dramatic distortions being spouted from the mouths of Central Bankers versus the facts in the real world. 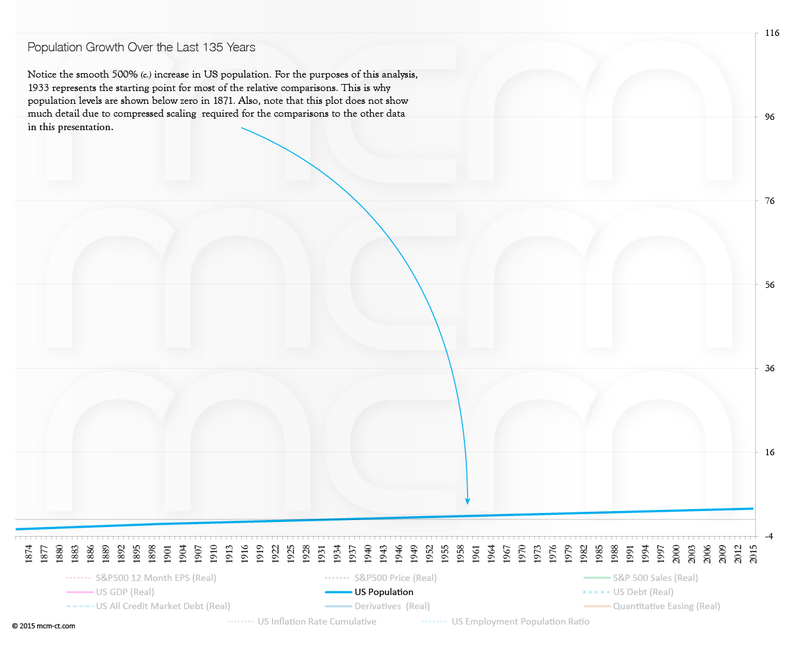 This chart demonstrates the dramatic amount of debasement and credit that has been irresponsibly pushed as the solution to growth problems, yet has produced little REAL growth over 120 years. The FED knows this. However, they seem to accept that engineering numbers to suit their current mood or agenda without much of a quandary. 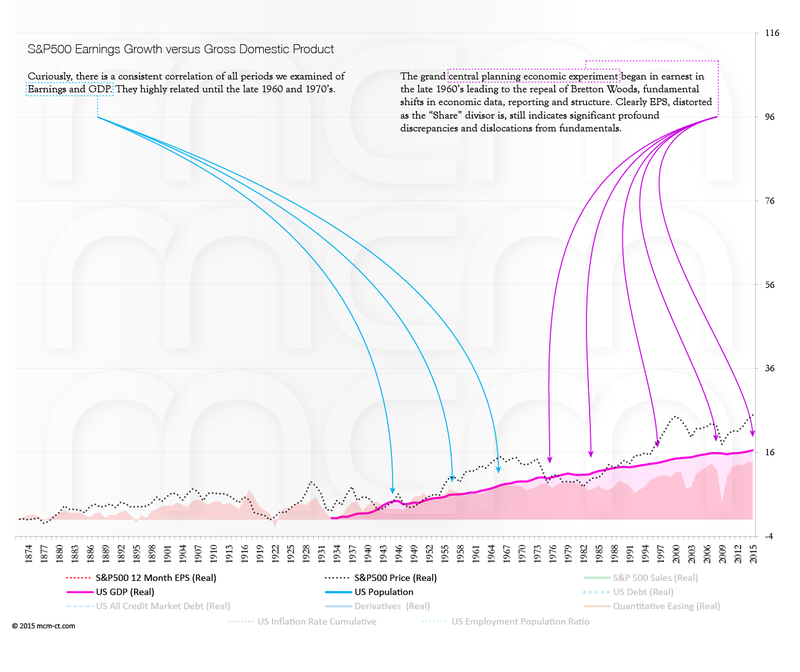 Real Earnings Growth (a product the FED does not market) is following the trajectory of the US population growth over the last 145 years. 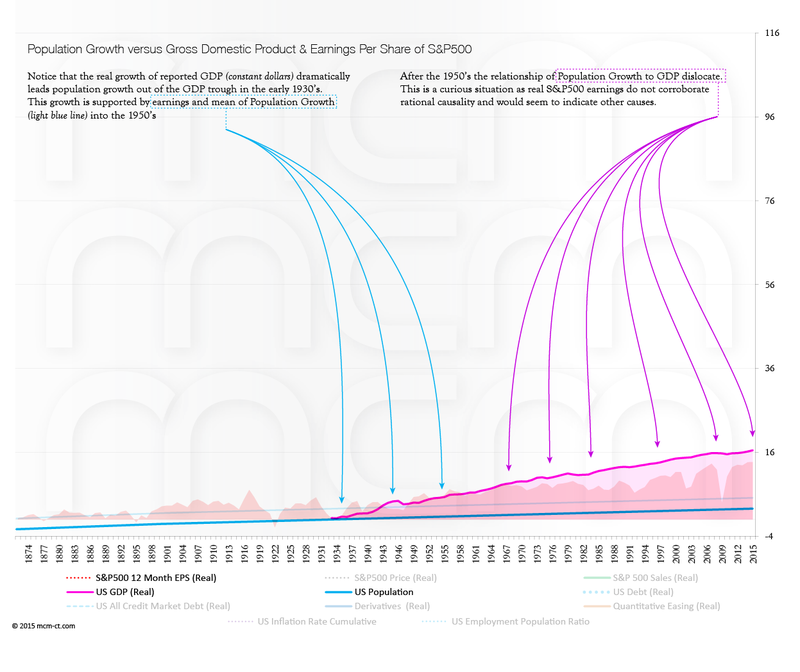 Debt and modern financial weaponry employed for money amplification have grown in the real terms by many orders of magnitude more than earnings. Is it any coincidence then that it is those very products marketed by Central Bankers to the world? 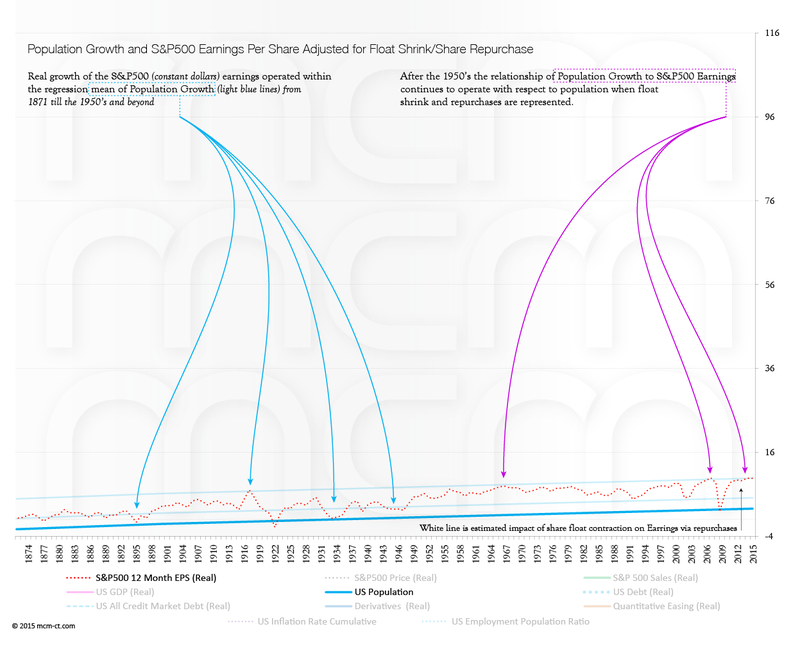 Clearly, it makes no sense to see S&P500 earnings and sales so out of kilter numbers reflected in GDP or CPI/PPI. There is simply no plausible defense to be offered by people whose math skills enable them to create the dichotomy between Nominal and Real performance as represented here that would convince a reasonably sensible person as to how 2 + 1 = 4 and the GDP numbers are perfect. So, in closing, the Monster has still not got a face, but it is being revealed. The only way to avoid its wrath would be for Central Banks and governments to get back to sound practices with regard doing their jobs and maintaining sound data, analysis, and currency. This would require tough choices and a keyboard with more than simply a “Control” button and a “P” button that is so profoundly used and evident in our charts. As our recent example, IMF will willingly lend to a country in complete and current default - Ukraine thereby prolonging its agony and impoverishing any potential its future economy may have had. At the same time, IMF/ECB wish to appear prudent with an impetuous Greece, who suffered a similar fate as Ukraine a few years ago. Ironically, IMF and ECB are marketing debt - its all they have to sell…how long will it take them to figure out some scheme to further leverage the > 98% and empower the < 2%? Sadly these are not choices that the Central Bankers will make easily, or willingly. Many will likely require judicial consequences in their various lands to alter practices. This monster looms large…it has not shown its true face but the mirror is shattering and in every shard will be a reflection of the beast - a beast that looks rather unlike the sanguine figures of central bank leaders. One thing is certain, appearance of this creature will be anything but pretty. Imaginary Numbers - Can You Afford to Believe Them?